Hey everyone! Sorry it's been so long, but I have some great news for you all out there. Now many of us Aaliyah fans out there have been waiting on a different version of Steady Ground for quite some time now, since You Know I Got Soul confirmed awhile ago last year of different arrangements/vocals without Static Major. However here is the official J-Dub remix of Babygirl's Steady Ground, who was also responsible for the production of the original version. I'm guessing J-Dub decided to keep Static Major's parts after all, which I'm kind of happy about since Static Major was responsible for a lot of Aaliyah's lyrical content. 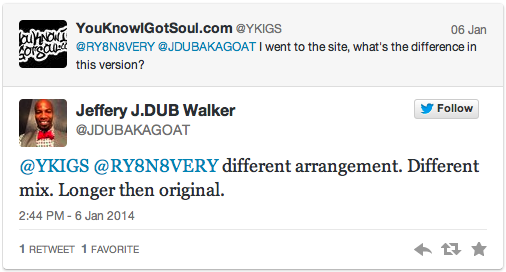 Above you can see that J-Dub describes the new remix as "different arrangement. Different mix. Longer then original ".